Do you struggle to make thick, evolving bass lines like those made by producers like Noisia? You're not alone. Scores of producers create simple, generic bass lines that sound thin and don't hold the interest of their listeners. In modern dance music heavy, aggressive bass lines dominate the mix and shake the earth. Sadly bass sounds that don’t live up to today’s standard can hurt your music and cost you fans. Fortunately there’s an answer. Modern software synthesizers like Native Instruments’ Massive offer amazing modulation capabilities and can be used to make incredible bass lines. Pair the synthesis power of Massive with Ableton Live’s resampling workflow and the results can be astounding. Last June Beat Drop played host to drum machine/synth wizard and Roland Senior Product Manager Lyle Crilly. He spent the afternoon giving us a run through of the history of Roland and an in depth look at how Roland's new AIRA line can be used in the studio and for performance. In case you missed if we filmed it and uploaded the workshop to our YouTube Channel. 1) Hardware is cheaper and easier to manufacture than ever before which makes owning gear nowadays comparatively far more affordable than in the past (owning a modular synth in the late 60s was akin to buying a luxury car). 3) While the software emulations of things like Minimoogs and other classic synths are getting quite good, there is a lot of variation in sound and feel with the real Minis out there. They were made for a decade. Therefore, a 1971 Mini won't behave exactly like on made in 1980. Individual instrument quirks can be important to musicians - analogous to a guitar player who really likes the feel of the neck or the tone on a particular guitar. 4) Inspiration. With everything conveniently at your fingertips it's all too easy to fire up Massive and start cruising through the list of presets until you find something that's close-ish to what you want. Then you mess around with parameters trying to make the sound more like what you hear in your head. It's not any easier making sounds from scratch on a hardware synth - in fact it's usually harder. But eventually one gets sick of all the presets and wants the inspiration that may come more naturally on and instrument with limitation - but has lots of character. It seems counter intuitive, but sometimes we can be the most creative by limiting our tools of expression. 5) Sound. Kind of stating the obvious here, but people wouldn't go through all this hassle if the sounds weren't worth it. So how does one use a hardware instrument within DAWs like Ableton? It depends on what the instrument is, how old it is, and how you intend on fitting it into your productions. Of course the most obvious way to incorporate a hardware is to just record the audio into Ableton. Sometimes there's something to be said for a sloppy, un-quantized synth line played by hand and recorded direct. If it's an old synth that has no means of MIDI or CV control recording the audio output may be your only option. If it's a pre-MIDI drum machine there might not be any way to "clock" or control its tempo externally. If that's the case its probably best to sample a pattern and loop it. Ableton's "Slice To MIDI" feature makes it easy to break down cheesy preset drum machine patterns into their constituent parts and re-sequence them in the box. If it's a more modern machine with MIDI you can opt to tempo or "MIDI clock sync" it. That way you still get the "feel" of the drum machine's own sequencer, just running in sync with Ableton. MIDI-equipped machines usually have the ability to trigger the individual sounds using MIDI notes, so patterns can be sequenced directly from the computer that way as well. There are lots of possibilities. Below is an example of a setup where the computer is controlling a Roland TR-8 through USB. The MIDI out of the TR-8 is going into the MIDI in on the Oberheim DX, which is a much older machine from the 80s and only has MIDI. The DX is being "slaved" by the TR-8 (they could both be used that way without a computer). However in this instance, they are both slaved by the computer which controls the master tempo and start/stop via USB. Sync has to be enabled in Ableton's MIDI preferences for this to work properly. It can be really frustrating to get your gear to work the way you think it should work. It doesn't help that MIDI has been around for over 30 years, and USB is only now starting to replace it. Very often outboard synths/drum machines won't sync properly or at all on your first try (make sure you are using the correct sync mode in your DAW’s preferences). Learn how to do a factory reset procedure on your gear (usually by holding a combination of buttons and powering the unit on and off) in case you get into a mode and can't get back out. Again, this is why reading the manual is a good idea. Luckily the latest hardware boom comes complete with devices designed to make our lives easier - marrying the old with the new. 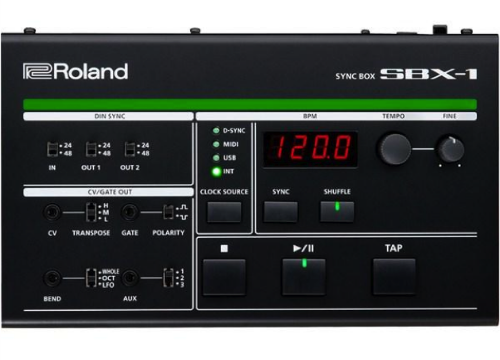 One such device is Roland's SBX-1 (see below). It can also hook up to a computer via USB and drive multiple drum machines/synths/grooveboxes through its 2 MIDI outs. For pre-MIDI machines it features "DIN Sync" which is an older proprietary system that Roland used back in the day for syncing and start/stop messages. The ubiquitous Roland 808 and Jupiter 8 both have it. The SBX-1 can also convert MIDI messages into CV and gate signals to drive old analog synths and modulars. Gotta love mixing the new with the old! Find out more about the TR-8 and the rest of Roland's AIRA line-up on June 13th, 2015 at Beat Drop. The Roland AIRA Clinic runs from 1 - 3 PM, is hosted by Lyle Crilly and it's totally free. On Saturday, June 14, Beat Drop will be running our monthly Ableton Live Quick Start course. From 10 AM to 5 PM Sandro Petrillo will be be providing an in-depth look at Ableton's fundamentals. This is an excellent opportunity to get a head start on producing music with Ableton Live and is aimed at those who have never used the program before. By the end of the course you should have a solid idea of how the program functions and will have plenty of ways to bring your musical ideas to life. Skratch Bastid and Chris Karns rolled through Beat Drop and laid down an amazing routine/performance. We had the privilege of shooting "Long Train Runnin" which has since blown up on the youtubes. Instructor and course developer C-Sik also got a few minutes to chat with them about their creative process, their history together and also about the Rane Sixty-Two Mixer. Some great insights from these two and some big knowledge they dropped on us. Check it. Last week we sat down with one of the West Coast's finest bass music and underground dance music contributors. Michael Red is a highly respected producer / remixer / DJ / label owner / event organizer / teacher / etc. etc. etc.... I think you get the point, this guy is knee deep in the world he's so very passion about, MUSIC! He was in Calgary recently (representing the LIGHTA! crew & Low Indigo) with the family from TheRinseOut playing a gig at their weekly Bass Music Celebration 'Northern Lights' . His production workshop was rather well received, discussing some of the more hidden gems of a music producer's mind; keeping organized, making lists, FINISHING music, were just some of the topics. You can trust when I say, people were surely taking notes! To Download the folder of Audio Documents click: HERE !! We're really excited to offer you another edition in our series of producer workshops. This time around we welcome a very talented and influential Canadian producer, Michael Red. He is an essential player in the West Coast underground music scene, whether its curating countless events or festivals, giving in depth workshops, running his label 'Low Indigo' or performing under one of his many aliases. To say the least this fellow is quite skilled in a wide variety of expertise. Michael Red is a Vancouver-based producer, performer, DJ and promoter. The founding member of Vancouver collective Lighta! Sound, acting captain of the Low Indigo entity, he also performs ambient-leaning music under the alias Souns and is a curator for the New Forms Festival. Together with Lighta! Sound, having played and/or helped to organize the majority of Vancouver's major dubstep events 2005-2009, Red has played a pivotal role in shaping the city's internationally recognized dubstep and bass scene, including the Red Gate, Secret Location, and Dubforms parties. Currently, Michael is cultivating a newer sound/movement under the Low Indigo banner through ongoing events, a casual blog, DJ mixes and music releases. As a performer, Red combines “sound art” with DJ art, improvising live and blending atmospheric touches with dancefloor sensibilities, all immersed in the careful spirit of dub. His DJ sets traverse the entire universe of “bass” and beyond, always mining the future for the most original and intriguing sounds he can find. He’s also known as a dancehall DJ, performs and tours with Inuit throat singer Tanya Tagaq, is one half of the experimental dub duo Chambers, and has done installation work with his own recordings.